Philo on the Father's House (Migration 3,4) at (Rutgers University Dept of Religion) Mahlon H. Smith's Into His Own: Perspective on the World of Jesus companion to the historical study of Christian texts. III.45, III.47, Against the Heathen, Athanasius of Alexandria, c. 318. Statement of Faith, Athanasius of Alexandria, c. 330. "'Believe in God, and believe in' Him, who, by nature and not by robbery, is equal with God; for He emptied Himself; not, however, by losing the form of God, but by taking the form of a servant." "As far as each one has been a partaker of Thee, some less, some more, such will be the diversity of rewards in proportion to the diversity of merits; such will be the multitude of mansions to suit the inequalities among their inmates; but all of them, none the less, eternally living, and endlessly blessed." "Thus, you see, they were convinced that they knew what they knew not that they knew." "When He says, therefore, "That where I am, there ye may be also," where else were they to be but in Himself?" "And yet He said not, Greater works than these shall ye do, to lead us to suppose that it was only the apostles who would do so." "Here, then, you see, He did greater works when preached by believers, than when speaking Himself to hearers." "What one, therefore, wishes to receive, in order to turn to an improper use, God in His mercy rather refuses to bestow." Book XIV, Paraphrase by Nonnos (c.450). Translated into English by Tony Prost. Home Page includes historical and literary notes. "This whole speech is an allegory, by which the Lord comforts his own." "Here are three words, upon any of which stress may be laid. Upon the word troubled. Be not cast down and disquieted. The word heart. Let your heart be kept with full trust in God. The word your. However others are overwhelmed with the sorrows of this present time, be not you so." Many Mansions (Jn 14:2). Sermon by Jonathan Edwards (1703-1758). "So there are many mansions in God's house. When this is spoken of heaven, it is chiefly to be understood in a figurative sense, and the following things seem to be taught us in it." "To the question concerning the way, he answers, I am the way. To the question concerning knowledge, he answers, I am the truth." "But it is no transfer of our trust from its proper Object; it is but the concentration of our trust in the Unseen and Impalpable One upon His Own Incarnate Son, by which that trust, instead of the distant, unsteady, and too often cold and scarce real thing it otherwise is, acquires a conscious reality, warmth, and power, which makes all things new. This is Christianity in brief." "He does not ask comfort, but he gives it." Commentary, John 14:1-14 (Easter5A), Karoline Lewis, Preaching This Week, WorkingPreacher.org, 2014. "There is always movement from misunderstanding to recognition of who Jesus is revealing himself to be, yet here, the stakes are higher." "Heaven Is a Home," Eric Barreto, ON Scripture, Odyssey Networks, 2014. Video: Immigration: Thelma's Story. "Promises, Promises," Nancy Rockwell, The Bite in the Apple, 2014. "In My Father's House..." Janet H. Hunt, Dancing with the Word, 2014. Pulpit Fiction, plus podcast. Reflections of lectionary text, pop culture, current events, etc. Robb Mc Coy and Eric Fistler, 2014. Will post early in the week. "Face of God," Andrew King, A Poetic Kind of Place, 2014. "A Place Prepared," Gayle Landis, Edgy Exegesis, 2014. "The Place Is the Way," Andrew Prior, First Impressions, 2014. "Let Jesus Show," sermon discussion from Frederick Buechner, Frederick Buechner Blog. "By believing against all odds and loving against all odds, that is how we are to let Jesus show in the world and to transform the world." In his Upper Room Discourse Jesus invites his disciples to “ask anything” in his name. Dorothy Day in Entertaining Angels: The Dorothy Day Story is shown several times asking God for help. The last prayer, uttered when her staff rebels against her using newspaper money to feed the hungry street people, is almost a demand that God do something, Ed Mc Nulty, Visual Parables. "Thomas," Frederick Buechner, Buechner Blog. "Even though he said the greater blessing is for those who can believe without seeing, it's hard to imagine that there's a believer anywhere who wouldn't have traded places with Thomas, given the chance, and seen that face and heard that voice and touched those ruined hands." "The Truth," Frederick Buechner, Buechner Blog. "Pilate asks his famous question, 'What is truth?' (John 18:38), and Jesus answers him with a silence that is overwhelming in its eloquence. In case there should be any question as to what that silence meant, on another occasion Jesus put it into words for his disciple Thomas. 'I,' he said, 'I am the truth' (14:6)"
"What It Means to Be a Christian," sermon discussion from Frederick Buechner, Frederick Buechner Blog. "Christian is one who is on the way, though not necessarily very far along it, and who has at least some dim and half-baked idea of whom to thank." Commentario, San Juan 14:1-14, Ismael Leon, Working Preacher, 2014. Commentary, John 14:1-14 (Easter5A), Sarah Henrich, Preaching This Week, WorkingPreacher.org, 2011. "This is a terribly difficult word to preach for surely there are always those among us whose heartfelt prayers have gone unanswered and whose hearts have been broken, whose trust shattered by Jesus' failure to keep this promise." Sir, You Room Is Ready, Fr. Rick Morley, a garden path, 2011. "I get uncomfortable with any version of our faith which turns Christianity into something that's all about us." Lectionary Blogging, Easter 5, John Petty, Progressive Involvement, 2011. "Monai is less about getting some fancy digs in the hereafter, in a house separate from the people you can't stand, and more about welcome, hospitality, and community for people traveling on a journey." "The Hardest Question," David Lose, WorkingPreacher, 2011. "If you could only ask God one question, what would it be?" "Do You Know Your Rights Miranda?" Peter Woods, I am Listening, 2011. "It would seem that our association with this Holy Spirit Advocate brings with it a winning argument against condemnation, as well as immunity from judgement by accusation." Holy Textures, John 14:1-14, Understanding the Bible in its own time and in ours, David Ewart, 2011. "I Am the Way,", Alyce McKenzie, Patheos, 2011. "Jesus is the way for those who dwell in an abyss of misery and futility. Jesus is the way for disciples going through the motions. Jesus is the way for new disciples who fear their questions are too basic." A Progressive Christian Reading of John 14:6, Carl Gregg, Patheos, 2011. "Ironically, it was a close reading of this same text, John 14:6, that was a turning point for me taking the Gospel of John seriously again." "Room Enough," Tripp Hudgins, The Hardest Question, 2011. "First Thoughts on Year A Gospel Passages in the Lectionary: Easter 5," William Loader, Murdoch University, Uniting Church in Australia. "[The disciples'] distress and confusion about Jesus? fate becomes a paradigm for confusion and distress in our own experience." Commentary, John 14:1-14, Jaime Clark-Soles, Preaching This Week, WorkingPreacher.org, 2008. "Should oikia be translated "house" -- a physical structure (as in 11:31 & 12:3) or "household" -- a community of people (as in 4:53 & 8:35)?" "Is Christianity a 'Sublime Bigotry?' 10 Reflections on the Gospel and World Religions," The Journey with Jesus: Notes to Myself, Daniel B. Clendenin, Journey with Jesus Foundation, 2008. Wellspring of the Gospel, Easter 5, 2005. Catherine McElhinney and Kathryn Turner, Weekly Wellsprings. "Do you wish for clear answers before you make a commitment to faith?" "The translation of the two uses of pisteuvete is difficult. Both may be either indicative or imperative." "Christ's Example of Servanthood (John 13:7 - 14:7)," by Hampton Keathley IV at the Biblical Studies Foundation. "No matter how bad things are going for us, we have no excuse for not serving others." "Facing the Future: A Prescription for Peace (John 14)," by Robert Deffinbaugh at the Biblical Studies Foundation. "He urged them to consider the final chapter of history before drawing hasty conclusions about the events of the immediate future." Reflection on John 14:8-17, Rev. Tom Harries. At Environmental Reflections, Lectionary Year A, Episcopal Diocese of Minnesota, Environmental Stewardship Commission. "Don't forget that Creation is redeemed and sanctified along with humanity according to Paul." "Worship in the Fourth Gospel: A Cultural Interpretation of John 14-17," Jerome H. Neyrey, Biblical Theology Bulletin, 2006. Part 2. "...the personnel of worship are clearly defined: the Patron Father who bestows benefaction on his clients by means of Jesus, the Broker. Jesus, in turn, brokers the concerns of the clients to the Patron. Finally, the household with many rooms is not space out of the world, but relationships brokered by Jesus." "Not only has the church subjected its members to a hierarchical relationship of dependency vis a vis the Christ that would preclude the actualization of such a divine potentiality, but as a participant in the culture of the Western world, the church has been captive to a five-hundred-year trajectory of material rationality that has eclipsed the reality of possibility. "Dwelling in the Household of God (John 14:2)," Dr. Mary Coloe, Australian Catholic University. "The song continues in the hearts of all Christians, for the cave of Bethlehem we now carry within. The holy place of Israel has become the holy place of our own lives." "The Sociology of Secrecy and the Fourth Gospel." Jerome H. Neyrey, in What Is John? Vol. II: Literary and Social Readings of the Fourth Gospel, 79-109. F. Segovia, ed. Atlanta: Scholars Press, 1998. "Once we start to pull back the veil, we notice numerous instances of hiding-revealing, secrecy, ambiguity and even lying. The following is an attempt to catalogue the primary and related instances of secrecy and "information control" in the document." Bellah, Robert N., "At Home and Not at Home: Religious Pluralism and Religious Truth," The Christian Century, 1995. Berger, Peter, "Protestantism and the Quest for Certainty," The Christian Century, 1998. Bock, Darrell, "Dribbling Circles around Jesus," Christianity Today, 2006. Camp, Lee C., "Theological Ground for Peaceful Co-Existence," Restoration Quarterly, 2007. Cox, Harvey, "Many Mansions or One Way? The Crisis in Interfaith Dialogue," The Christian Century, 1998. Fee, Gordon D., "John 14:8-17, Expository Article," Interpretation, 1989. Köstenberger, Andreas J., "The 'Greater Works' of the Believer According to John 14:12," Didaskalia, 1995. O'Day, Gail R., "'Show Us the Father and We Will Be Satisfied' (John 14:8)," Semeia, 1999. Peters, Ted, "A Christian Theology of Interreligious Dialogue," The Christian Century, 1986. Segovia, Fernando F., "The Structure, Tendenz, and Sitz im Leben of John 13:31-14:31," Journal of Biblical Literature, 1985. Sharma, Arvind, "Christian Proselytization: A Hindu Perspective," Missiology, 2005. Smit, Laura, "The Image of Home," Theology Today, 1988. Stroupe, Nibs, "Looking on the Other Side: Preaching in a Multicultural Society," Journal for Preachers, 2006. Wakefield, Andrew H., "What Happens When We Pray?" Review & Expositor, 2007. Williamson, Lamar, "Many Rooms, One Way: Preaching John 14 in a Pluralistic Society," Journal for Preachers, 2006. Willimon, William, "Answering Pilate: Truth and the Postliberal Church," The Christian Century, 1987. Willimon, William H., "Pastors Who Won't Be Preachers: A Polemic against Homiletical Accommodation to the Culture of Contentment," Journal for Preachers, 2006. "Seeing the Glory," Samuel Wells, Faith and Leadership, 2012. What Good Can Come Of This? 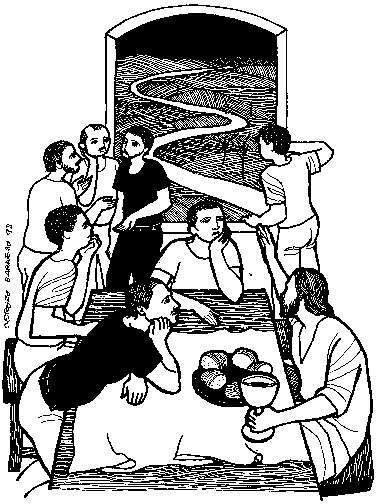 -- Story/Sermon for Easter 5 based on John 14:1-14 by Constance Berg from SermonStudio. "No Power Shortage Here," the Rev. Dr. Fred R. Anderson, Day 1, 2008. "God's Promises for You: I Prepare a Place for You," the Rev. Allen Hunt, Day 1, 2007. "Doing Greater Things Than Jesus?" Easter 5 - 24 April 2005, Hubert Beck, Göttinger Predigten im Internet: Every Sunday Sermons based on the RCL by a team of Lutheran theologians/ pastors. "Show Us," the Rev. Robina Marie Winbush, Day 1, 2002. "Only One Way Out," Pastor Edward F. Markquart, Grace Lutheran Church, Seattle, Washington - Sermons from Seattle. "The Body of Christ Takes Up Space on Earth," the Rev. Barbara K. Lundblad, Day 1, 1996. "Heaven," Illustrating the Story (lessons, children's sermons), coloring pages, activity sheets, crafts, children's songs. MSSS Crafts. "Finding the Way," Charles Kirkpatrick, Sermons4kids.com. "Jesus Is the Way, the Truth, and the Life," Sunday School Lessons: Family Bible Study, art projects, music, stories, etc. "The Greatest Wish," "Trinity," "My Father's House," "The Way," Jim Kerlin, childrensermons.com. "The Way, the Truth and the Life," children's study, puzzles, coloring sheet, etc. Higher Praise Christian Center. Crossword on John 13 & 14, Don Crownover's Bible Puzzles. "Coming to the Feast of the King," Marjorie Kennedy, dramatix. "I Am the Way," John McNeil, dramatix. "The Way," Krista Esperat, dramatix. "Ascension?" Michael English, Milton Parish Church Drama Resources. Clip Art, John 14:9, Fr. Richard Lonsdale, Resources for Catholic Educators. Clip Art Images: John 14:1-12, Misioneros Del Sagrado Corazón en el Perú. John 14:1-12, at Cerezo Barredo's weekly gospel illustration. Liberation emphasis. "Christ, You Are The Savior," Carolyn Winfrey Gillette's new hymn celebrates Jesus' teaching in John 14:6 in the context of his inclusive ministry for all. Tune: ASH GROVE 6.6.11.6.6.11 D ("Let All Things Now Living"). Hymns with Scripture Allusions: John 14:1, 2, 3, 6, 8, 9, 13, 14. The Cyber Hymnal. "Walk on ahead, Good Shepherd," "Our Refuge," Brenton Prigge, NewHymn, a new, relevant hymn set to traditional tunes. "We'll Be with Him," TEXT: Mark Ryman (2005) based on John 14:1-14. TUNE: "What a Savior." New Hymns for the Lectionary.